It seems there’s more people looking for iPhone waiters on Craigslist than waiters available to wait. But here’s the really galling part. He wants waiters with experience! “Interested applicants should have experience waiting in line,” the ad says. Meanwhile, in L.A, waiters must be reliable and focused; in San Francisco, creeps and criminals need not apply; and in NYC, security in apparently not an issue. 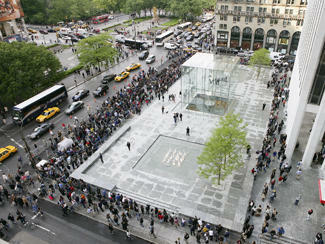 Wait in line for Iphone for me! No 3G, Wi-Fi, etc. A basic phone, but one that is sleek and easy to use. Using the wheel for typing SMSes might be somewhat challenging though! Digging for the iPhone ? ?